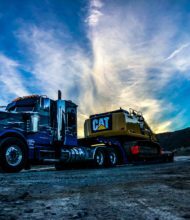 If you are looking for a reputable, construction trucking company, Monzon and Son Enterprises serves 90% of its construction trucks for the Los Angeles infrastructure sector. It is important to choose a reliable and reputable construction trucking firm that is focused on customer service, reliable construction trucks and skilled drivers in order for projects like the Gerald Desmond Bridge, LA Metro and reconstruction of Freeways run smoothly. Our President, Kelvin Monzon, grew up in and around trucks, and it is rumored that he was driving trucks before he was 10 years old. Our President’s vision and goal is to make Monzon & Son Enterprises armed and able to serve every, and any customer’s construction trucking needs. Which is where our motto, “We TRUCK IT All™,” comes from. We have over 20 years in the industry, and are confident that our employees, our equipment, and our experience will take care of your every need. We are a certified disadvantaged company holding the following certifications: DBE, SBE, MBE, LBE, and other local certifications. We Truck it All, is our company motto. We do so with a variety late model, well-maintained company owned trucks (All PORT Compliant) and trailers. Aside from our company trucks we also have Owner-Operators that pull our trailers on a daily basis, and whenever there is a higher demand of trucks we have a network of independent truckers that come and help on our jobs. We currently own and operate: 30 Bottom Dumps, 10 End Dumps, 10 Super-10’s, 10 Flat Beds, Lowbeds and a Tow Truck. Monzon & Son Enterprises believes strongly in sustainability and growth, and with that we strive to stay involved in the industry. We are an active member of the Western States Trucking Association, where our President is the Chapter Chairman for the South-East Los Angeles area and Treasurer of the Association. What's happening at Monzon & Son Enterprises Inc.